Sharon Meers, co-author of Getting to 50/50 (Viva Editions), was recently featured on her methods for having a full family life and a full career. Sharon Meers, a former Goldman Sachs managing director, and current head of eBay’s Magento enterprise strategy unit, was recently featured by Quartz for her strategy to build a family-friendly career. Meers explained her strategy as, "Look for skills that are scarce, and often that means technical in some way…It’s like building a company, you want barriers to entry, you want a defensible niche, something that you are uniquely great at. Because, I think, once you have that, it becomes much easier. You are a valued employee. And when you become a parent, and if you choose to work differently, in a way that other people think is odd, they’ll say, 'Yeah, but she’s really good.'" SHARON MEERS leads global business development and sales for X.commerce, the open commerce platform of eBay, helping merchants grow with better technology. Formerly, Meers was a managing director at Goldman Sachs, where she worked for 16 years and was co-chair of the Women's Network in the Investment Management Division. She and her husband founded the Partners for Parity at Stanford Business School and the Dual-Career Initiative at Harvard. 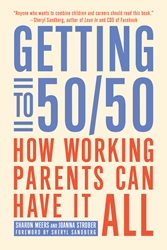 Along with Joanna Strober, Meers is the co-author of Getting to 50/50: How Working Parents Can Have It All (also available in audiobook).